Whether you believe in the existence of a rabbit that has an endless supply of chocolate at its disposal or not, I think it’s safe to assume that we all love a bit of Easter chocolate. Easter, and the chocolate that comes with it, is arguably the best part of Spring. Personally, nothing says Spring like breaking a chocolate egg in half to use as an edible bowl; Willy Wonka style. However, chocolate can also be a vegan’s downfall. People don’t always consider the milk content of the chocolate they’re eating – even more so with dark. Yes, even dark chocolate can contain a surprising amount of milk. Those more eagle-eyed vegans may have realised how difficult it is to find quality vegan Easter chocolate eggs in supermarkets. Walk down the promotional Easter aisle of your supermarket and you’ll be surrounded by milk – a lactose nightmare! Our vegan Easter treats help you enjoy the holidays dairy-free and make great gifts. You can even give some to a non-vegan friend to see if they can tell the difference. The brilliant taste could convert them to the bold flavour of milk-free and dark. Here are just some of the brands we stock that have impressed us with their delicious vegan Easter treats. Well, the clue’s in the name. There are no moos in these eggs, nor are there any by-products of things that go ‘moo’ – namely dairy. Named for their cause; Moo Free are dedicated to keeping dairy far away from their chocolate; with delicious results. Their vegan Easter treats are no exception, with exquisite milk-free chocolate eggs in a variety of flavours. The bunnycomb egg uses vegan honeycomb while the orange egg is full of natural orange flavouring. The original egg comes with a collection of tasty dairy-free buttons hidden inside. What’s more, these eggs are all soya and GM free too; keeping your Easter as healthy and tasty as can be. It’s not just eggs either. Moo Free do a whole range of delectable chocolate bars and tasty chocolate drops. They even do milk-free baking drops to help you make some vegan-friendly chocolate cup-cakes for the occasion. Booja Booja doesn’t just take the dairy and lactose out of the equation; they turn chocolate eating into an event. One look at the presentation of this egg and you’ll see why. The beautiful floral patterned casing and the gold ribbon give it a grand, classic design. You get a personal touch with Booja Booja Easter Eggs too. The patterns these fabulous eggs have are all a unique piece of art; guaranteeing you a one-of-a-kind egg. It’s almost a shame to unwrap them really, but then you remember what’s underneath the egg-shaped box. 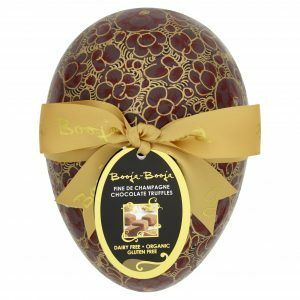 The chocolate egg itself is delicious (perfect for bowl-making) and hides away some exquisite champagne truffles. There’s no trace of dairy in either the chocolate or truffles, plus the case doubles up as extra storage. Any regular shopper of Ethical Superstore will be well acquainted with Divine. Their vast range of luxurious chocolates has been a treat-desk mainstay in our office for quite some time now. Not wanting to fall behind, Divine also has a delectable egg to tuck into this Easter. 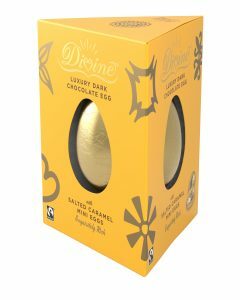 This delectable dark Easter egg is not only mouth-watering and free from dairy, but it also carries FairTrade certification. Hidden inside are a small cluster of salted caramel mini eggs for sharing (but probably not). Here’s another chocolatier that needs no introduction. 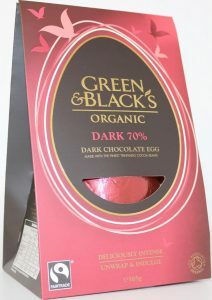 Their 70% dark chocolate egg has a delectably sharp taste that even non-vegans will find hard to resist. The absence of milk and dairy not only makes this egg vegan-friendly, but it also gives it an incredibly bold taste. The recipe combines FairTrade sourced chocolate with organic ingredients for a natural taste; unaided by needless GMOs and flavourings. These are just a handful of the impeccable vegan Easter treats that Ethical Superstore offers. All year round we stock a smorgasbord of succulent vegan chocolates – both dark and plain. Check out our gift guide section for more ideas for delicious vegan Easter treats for your friends and family.